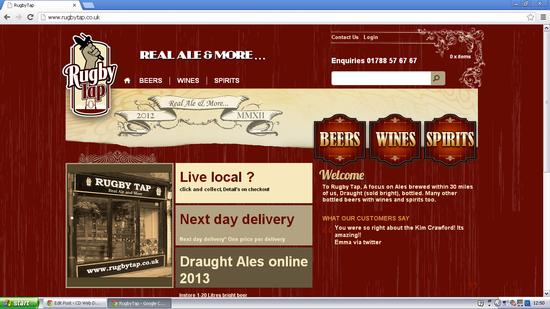 CD Web Design » Anything Else.., Our Latest Sites » Rugby Tap – Cybertill Retail Store 2 eCommerce site goes live..
Rugby Tap – Cybertill Retail Store 2 eCommerce site goes live.. They have had a full bespoke eCommerce solution using the latest Retail Store 2 cloud software. This is what Colin said about CD Web Design..
“When I opened my new business I invested heavily in a cloud based multi-channel epos and e-commerce website. After a period of frustrating delays caused by myself learning on the job and slow communication with the site designers and builders, I sought some 3rd party help and was fortunate to find Chris who is fully conversant with all aspects of the system I am using and got my website up and running in a shorter timescale than agreed. Another happy customer.. Simons Systems website and stationery package.. This entry was posted on Wednesday, December 12th, 2012 at 12:13 pm and is filed in Anything Else.., Our Latest Sites by CDWeb. Bookmark the permalink. You can follow any responses to this entry through the RSS 2.0 feed. Pinging is currently not allowed.